9/29/2017 The delayed triggered ability created by Jace’s first ability can trigger more than once in a turn if creatures you control deal combat damage at different times in a turn (most likely because one or more has first strike) or if creatures you control deal combat damage to more than one player at once. 9/29/2017 If a token created by Jace’s second ability becomes the target of a spell, its ability triggers and goes on the stack on top of that spell. The ability will resolve first (causing the token to be sacrificed). Unless the spell has another target, it will then be countered when it tries to resolve for having no legal targets. 9/29/2017 The tokens from Jace’s last ability copy exactly what is printed on Jace and nothing else. They don’t copy how many counters are on him or Auras attached to him, or any non-copy effects that have changed his color or types, and so on. They’ll each enter the battlefield with three loyalty counters. You can activate one loyalty ability of each of the tokens this turn. 9/29/2017 The tokens created by Jace’s last ability don’t have the legendary supertype. If another object becomes a copy of the token, that copy also won’t be legendary. 9/29/2017 You can control one legendary Jace, Cunning Castaway in addition to any number of nonlegendary copies of Jace, Cunning Castaway. This + Doubling Season = Infini-Jace! Pirate Jace is probably the funniest thing I've seen this week. It seems weak, though. Looting becomes less effective when done repeatedly at the same time, since you quickly run out of unwanted cards. The -5 is a very interesting and unique effect, but I'm not sure that generating multiples of these is particularly game-breaking. This basically never reaches a point where it can do something that dramatically alters the balance of power in the game, as most planeswalkers do. I thought planeswalkers weren't legendary and instead covered under the planeswalker uniqueness rule? In retrospect, Wizards kind of HAD to make this change. If wizards wants to keep reprinting the gatewatch characters, the uniqueness rule would only get in the way. This change frees them to include multiple versions of a single walker in close proximity (as we are abandoning proper "blocks") and removes some of the pressure to constantly introduce new planeswalkers (especially as the "legendary creature to planeswalker" formula won't work as well without blocks). What you are describing wasn't a bug, it was a feature. That you could only play one 'mode' of planeswalker at a time was something I liked about them. Honestly, how many decks do you have that play two different planeswalkers with the same subtype? It looks as though we're experiencing a rules and templating change? We are. Wizards posted their "Mechanics of" article and it appears all planeswalkers are getting errata to just be normal legendary permanents. Which means multiple Jaces are now possible, and you can Mirror Gallery multiple of the same. ...aaaand just purchased a second captain sisay. "You are without doubt the worst pirate i have ever heard of." Empress Galina can steal plansewalkers now. 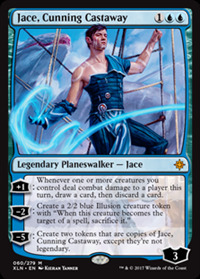 Kinda sad they didn't make a Dimir version of Jace just so we say that Nicol Bolas beat him until he was black and blue.